Broadridge is a suite of investor communications and technology-driven solutions that cater to the needs and specifications of banks, broker-dealers, mutual funds and corporate issuers. Its product lines include investor and customer communications, securities processing, and data and analytics solutions. Broadridge solutions are built to help clients deliver high-quality services to their retail and institutional customers across the entire investment lifecycle, including pre-trade, trade, and post-trade processing functionality. 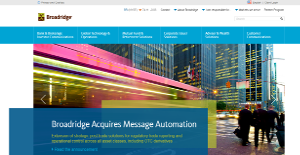 Serving a base comprised of four client groups – capital markets, asset management, wealth management and corporations – Broadridge now leads the way of multi-channel communications, bolstering your capabilities to communicate with your clients and investors and adhere to regulatory requirements. Broadridge Investment Management Solutions delivers buy-side technology platforms that are specifically built for the global investment management industry. It comes with core capabilities such as order management, data warehousing, reporting, reference data management, risk management and portfolio accounting, features required by hedge fund managers, investment managers and the providers that operate in this sector, including prime brokers, hedge fund administrators, and custodians. Broadridge boasts a set of multi-currency systems that enable users to perform real-time processing of securities transactions in North American equities, options, fixed income securities and mutual funds. Equity and options transactions that are processed in the United States are supported in real time by the Brokerage Processing Services (BPS), its multi-currency back-office processing system, On top of that, Broadridge gives small and mid-market financial firms that operate in Canada a throng of transaction processing tools and services. Broadridge provides business process outsourcing services collectively branded as the Managed Services solution, which is capable of supporting the operations of its clients’ businesses, such as their securities clearing, record-keeping, and custody-related functions. Its clients execute and clear their securities transactions and engage Broadridge to do several related administrative back-office tasks, like record-keeping and reconciliations. If you are interested in Broadridge it might also be beneficial to investigate other subcategories of Best Business Process Management Software collected in our base of B2B software reviews. There are well-liked and widely used systems in each software group. But are they essentially the best fit for your enterprise’s special wants? A trendy software application may have thousands of subscribers, but does it provide what you need? For this reason, do not blindly invest in popular systems. Read at least a few Broadridge reviews and think about the elements that you wish to have in the software such as the cost, main functionality, available integrations etc. Then, select a few apps that fit your needs. Try out the free trials of these platforms, read online opinions, get clarifications from the maker, and do your homework systematically. This exhaustive research is certain to assist you choose the most excellent software application for your company’s specific wants. How Much Does Broadridge Cost? Broadridge’s SMB and enterprise pricing information is available only upon request. Contact the company for more details, and ask for your quote. We realize that when you make a decision to buy Business Process Management Software it’s important not only to see how experts evaluate it in their reviews, but also to find out if the real people and companies that buy it are actually satisfied with the product. That’s why we’ve created our behavior-based Customer Satisfaction Algorithm™ that gathers customer reviews, comments and Broadridge reviews across a wide range of social media sites. The data is then presented in an easy to digest form showing how many people had positive and negative experience with Broadridge. With that information at hand you should be equipped to make an informed buying decision that you won’t regret. What are Broadridge pricing details? What integrations are available for Broadridge? If you need more information about Broadridge or you simply have a question let us know what you need and we’ll forward your request directly to the vendor.